Our Parking Lot is Small but Mighty! 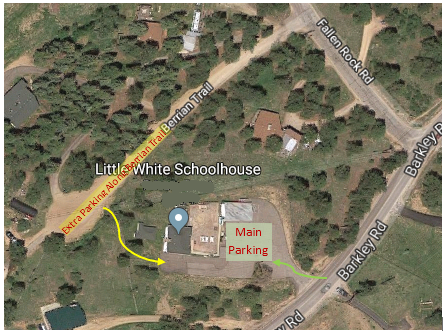 Whether this is your first visit to the Little White Schoolhouse or you’ve been here before, it is good to know that our main parking area is pretty small (~30 spaces)! Our programs and events often sell out. If you are able to carpool with your friends, that is great! When arriving, please take care to park straight into your spot and not at an angle. Parking “in formation” (close to neighboring cars!) allows us to fill this lot to capacity. We don’t have stripes painted, so just do your best and please be kind and patient to other visitors. Thanks! In the event you arrive and the parking lot is already filled up, there is on-street parking available in the cul-de-sac behind the school. To get there, Turn on Fallen Rock Rd (one street up from the Schoolhouse) and then take the first left onto Berrian Trail. There is a dirt path (highlighted with a yellow arrow below) that takes you right to the back of the schoolhouse. If you’re not quite sure how to find this secret spot, just let us know and we’ll point you in the right direction!